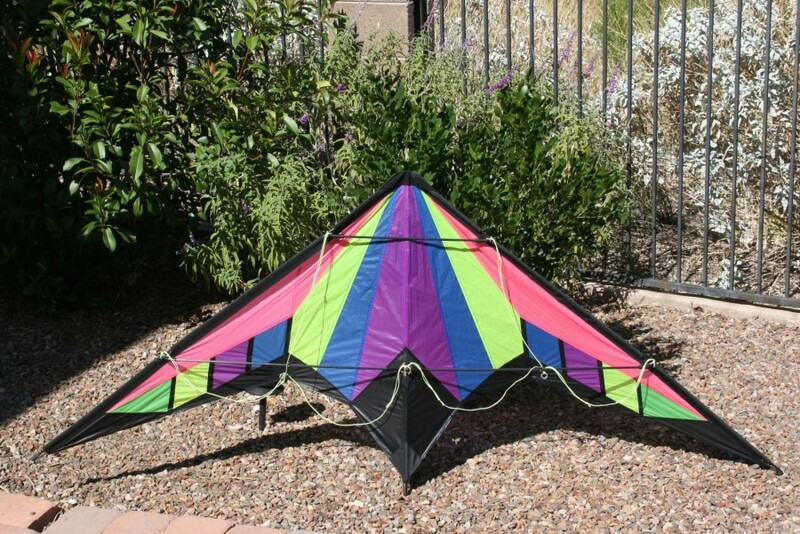 I need help to identify this kite, I picked it up from Eric in Madison, WI. He was unsure of the name. It has no labels or markings, it has rings on the bridle for attaching the lines which makes me belive it is an older design. The package came with a "This kite belongs to" sticker from Into The Wind which may or may not indicate the retail source. I have exhausted all my resources (unfortunately my "old-old" Into The Wind catalogs vanished mysteriously) and haven't found anything. Any ideas, who, what, where, when? i am thinking Go Fly sport kite.....that husky yellow bridle..
to add to your archive: have you searched out the old BFK catalog online? the wayback machine is GREAT!!!! you can plug in any old url and most likely they will have a copy of it somewhere....although if it is a deep as you like? not always...but it helps! It looks like it could be an Edge by Go Fly A Kite. I have a Mini-Edge that looks a good bit like it without the lower edge row of rainbow color. It does have a bit of Spectra Sport look to it also.